At the conclusion of this seminar, attendees will have up-to-date criteria for diagnosing neoplasms of the hematolymphoid system, both within lymph nodes and at extranodal sites. The proper use of ancillary studies will be illustrated, and the importance of the integration of morphologic, immunohistochemical, and molecular data will be stressed. They will know how to apply the 2001 WHO system to accurately classify these neoplasms. In addition, they will be made aware of recent advances in our understanding of hematolymphoid neoplasms. The 124th Tumor Slide Seminar will be given by Dr. Cheryl M. Coffin, currently Professor and Vice Chair of Anatomic Pathology, Vanderbilt University, Nashville Tennessee, a recent change from being Professor and Head of Pediatric Pathology at the Utah School of Medicine. She has extensive journal editorial experience including the senior editorship of Pediatric Soft Tissue Tumors. As a member of numerous cancer research projects, she holds academic positions at the Universities of Utah, Washington, and Minnesota. She has over 125 publications as well as numerous book chapters. Her presentation on 14 pediatric tumors will update us on solid neoplasms of childhood and include a 100+ page, full color syllabus. It is a lecture not to be missed. 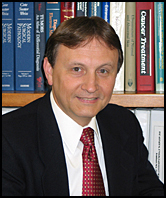 Dr. Saul Suster is Professor of Pathology and Vice-Chair for Pathology at Ohio State University. He is also Director of Anatomic Pathology at Ohio State University Medical Center, the Arthur G. James Cancer Center, and the Solove Research Institute. Following medical school in Guayaquil, Ecuador and a rotating internship, he did his initial pathology training at the University of Tel-Aviv Sackler School of Medicine and later did a pathology residency at Mount Sinai Medical Center of Greater Miami. He studied with Juan Rosai at Yale University and developed special expertise in electron microscopy, immunohistochemistry, and molecular biology. His contributions in national and international organizations are numerous. Dr. Suster has published over 100 abstracts, over 200 papers and has written 20 book chapters on topics ranging from thymus and mediastinum, lung and pleura, skin and the endocrine system. Glass microscopic slides and digital images representative of fifteen to twenty tumors of importance to surgical pathologists. Six hour lecture, incorporating projected photographs of the cases and other illustrative materials. Comprehensive printed color syllabus, including diagnosis, discussion, and appropriate references from pertinent medical literature.